Above is my free campsite (2016) at Ocotillo Wells State Park in the California Desert west of the Salton Sea. My first year traveling (2014) with my Class B campervan I had a concept of staying overnight free or low cost but being new to this way of life, I didn't know the possibilities of where to stay. I left MA in 2014 and on my way to the southwest via Florida I stayed at campgrounds if I didn't have a plan on where to stay for free. I was apprehensive to park at Walmart in FL as my Class B stood out. I stayed in the yard at my aunt's place in a trailer park for free, but this was a no risk thing to do. It was free and convenient. I stayed at my cousin's in south Florida in her gated community apartment complex parking lot, taking a bit more risk as there was roving security. I then traveled around FL to Everglades National Park and private campgrounds spending money every night. The best was the Everglades National Park where I got my senior pass and half off my camping there. At the private campgrounds I paid $35 to $40 a night. I stayed in Northern Florida at a state park not knowing there was free Fotest Service disbursed camping 10 miles away. I traveled across the south heading west to AZ on I10 and I finally became brave enough to walk in to a casino in MS and ask permission to stay the night in their parking lot. Then I did the same at a Walmart in TX. 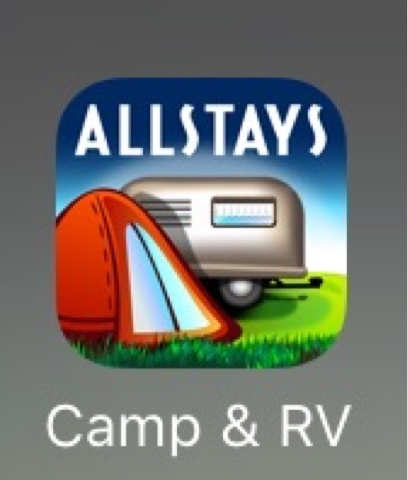 I had the App for my IPhone called AllStays. That provides both paid and free overnight stays. It is a good tool but it is not nearly comprehensive enough to cover all places. In the month it took me to get to AZ in 2014 I had paid out a few hundred dollars to stay overnight. The rest of my first year was pretty much the same way spending money not knowing the ropes to boondock and disbursed camping. I was not wanting to take risk or be rousted by the police and staying in a few free places including truck stops. My second year (2015) I had sold the Class B and bought the Prius for this year's travels mostly because of the cost of fuel and not because of stealth. Stealth turned out to be a great option with a Prius as no one expects someone to be living in such a vehicle. Although changing my mode of travel was the most significant change, joining CheapRVLiving.com (CRVL) and learning from others shared experience from the Vandweller Community was second. I wished I had known about this group the first year 2014. 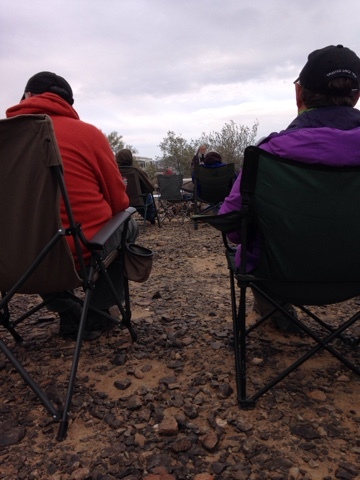 Unfortunately, I was not able to leave early enough in 2015 to make the RTR group gathering in Quartzsite, AZ that year. 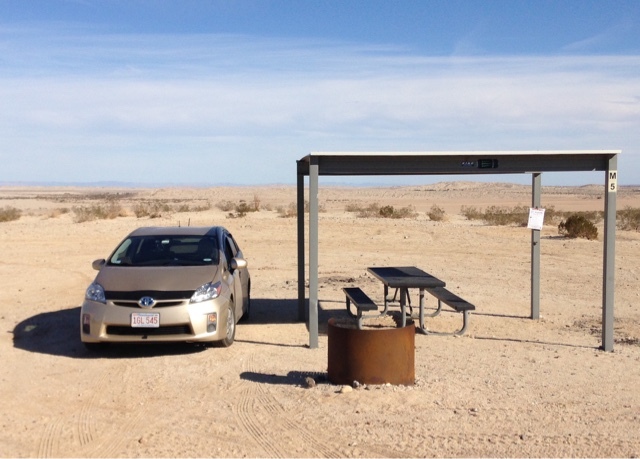 I arrived just after the event and met a fellow Prius Traveler Suanne in nearby Ehrenburg, AZ. Suanne is someone who helped in my inspiration of traveling in a Prius as she has been doing it for years. I also met Bob Wells, the founder of CRVL there. Although I didn't get to meet others and absorb their knowledge, I was online and gleaming what I could from the online group forum. This year (2016) I left early enough in January to make the RTR, and there the one on one sharing flows easily and friendships are formed and faces replace online handles people use on e group's forum. 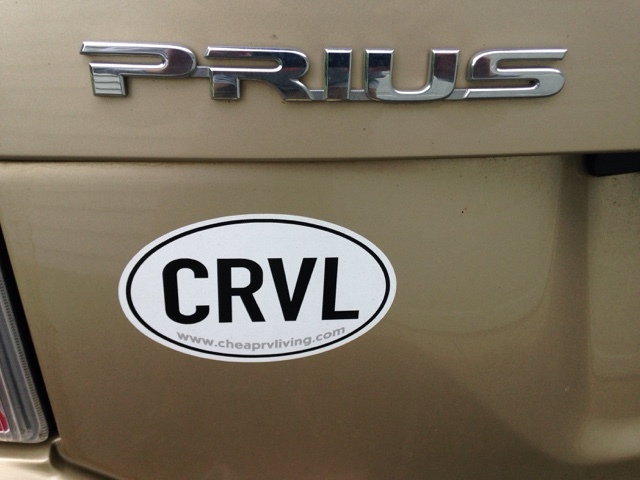 So, regardless what you travel/stay in I recommend joining CRVL and start your learning process. Now back to where I stay. Driving a Prius is like the ultimate stealth vehicle if you manage how you handle yourself effectively. This means that you can park many places and not be noticed provided you don't do things to stand out. I will create a separate post on stealth in a Prius later. First do not park where it is posted no parking or no overnight parking unless you ask permission, like Walmart. I generally do not stay in the same place two nights in a row (truck stop, Walmart, rest area, casino) unless it is generally allowed like BLM, Forest Service, Federal, or State land. If allowed with no signs saying otherwise, you need to follow the rules for the land you are on. For example BLM land has a 14 day limit in 28 days. In AZ it is easy to move every 14 days 25 miles away and come back if you like. You need to learn the rules and you will over time. FreeCampsites.net is a great website to augment AllStays. Campendium.com also provides listing of sites. You get federal maps online or at the Federal office for that area. You look for Disbursed Camping online or ask for rules. There are other paid sites but I generally don't use paid sites. I find enough places to stay with free sites. What I did learn was that if a site is listed as BLM there will be one pin drop for each area. The is does not mean you can only stay at that one spot. You can stay many places in the area. 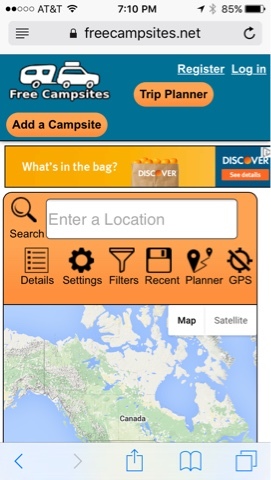 Even if the Forest Service shows camping for a price on your app there may be disbursed camping at no cost in the area. You again need to have the rules. The best rule is if you find a campsite with a fire ring and it is disbursed you can stay if not posted otherwise. I never have fires so any existing pullout is good for me as long as not posted. There are apps and websites with maps of federal lands. There is so much land in the southwest that it's not hard to find a place to disburse camp I the general area of interest. This year (2016) I found free disbursed camping outside each of the 5 National Parks in Utah. The thing to remember is that if you are over 62 you can get a lifetime pass to the National Parks to get in and half off camping. This is a good deal and could be better than looking for disbursed camping. From time to time I stay in cities and towns using legal street side parking. I scout out the area in advance and have a backup plan. At dusk I park and slide into the back for the night. Close my shades and leave before 6:00 am. Then not use that area for days. I would say that is you choose to travel this way you will learn from others and join CRVL and if you have questions there are I've 1700 people that can help answer your question. Many people go to the RTR for their acclimation to this life. There will be a summer RTR outside Flagstaff, AZ in June.